Following the success of Avani at Metrogate, Tridel is moving forward on the second phase of its master planned community. Avani 2, a modern, residential tower, will be located at Kennedy Road and Highway 401 in Scarborough. The condominium overlooks Metrogate Park, a sanctuary for neighbours to relax, play and congregate. One and two bedroom suites with den options are currently available. The residence will include exceptional amenities such as an inviting lobby, entertainment venues, outdoor terrace and a state-of-the-art fitness centre. 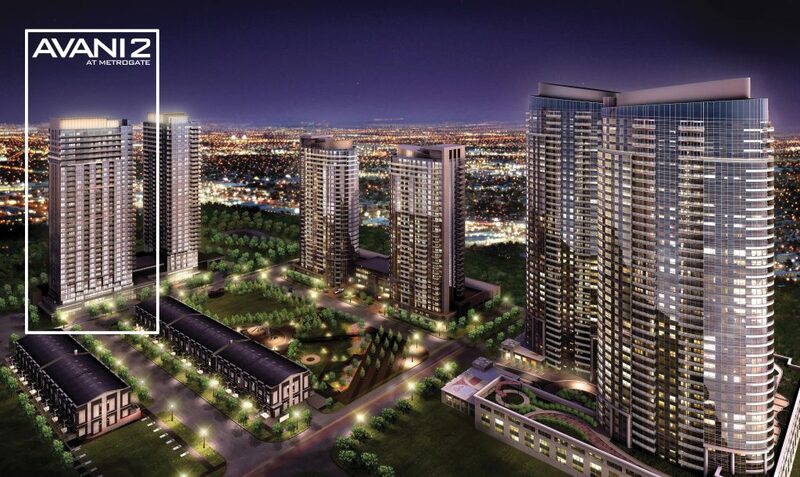 With onsite retail shops and a daycare centre, Avani 2 provides convenient, community living. Scarborough is home to an abundance of outdoor attractions — explore the Toronto Zoo, the architecture of Guildwood Park or the hiking trails at Rouge Park or along the Scarborough Bluffs. Commuting is made easy thanks to Avani’s proximity to Highway 401, the Agincourt GO Station and the TTC Midland Station. The Agincourt Mall is just a few minutes’ away and includes a Wal Mart, No Frills, LCBO and the Beer Store. Looking for some serious retail therapy? The Scarborough Town Centre is the third largest shopping mall in the city of Toronto, featuring name brand retailers and a Cineplex theater. Don’t forget to register online for exclusive updates on Avani 2. Prospective buyers are encouraged to visit the presentation centre at 52 Village Green Square in Scarborough. For more information, please call 416 293 5535.